You know there's something terribly wrong when a software company launches an unlicensed title that has one name in the box and a different name in-game, even more when one of the names is spelled wrong. The game in question is the horrendous Earth Defense or "The Earth Defend", as you'll see when you power it up. Just to get it out of the way, don't try to play this game with a Sega 32X setup, because it just won't work - you'll have to use a plain good old Mega Drive. Of course name problems should never be an indication of game quality, as the outstanding "Lightening Force" will surely tell you. 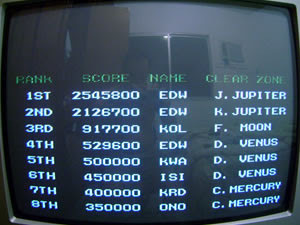 However, and without incurring in its uninspired technical achievements, Earth Defense is notorious for its atrocious programming, which is responsible for such things as almost permanent slowdown, high score resetting with RESET button, unbalanced weapon distribution and boss disappearance followed by an irreversible game halt in the first stage! The gameplay is bland and overall very boring. Two types of weapons allow you to use a forward blade-type shot and a spread shot. The first one is useful from the start, but the spread shot only shows its potential after 3 power-ups collected. There are also icons for options, 1UPs and bombs/shields (that work in the same vein of the mecha arrow flash in Arrow Flash). All icons appear randomly after you destroy a trademark enemy, but the AI is so awkwardly unbalanced that you might sometimes get 3 or 4 lives in a row, or spend a whole stage collecting just one type of power-up. If you get to the bosses with a good power level they will give in pretty fast, especially if you fly over them using the "arrow flash" shield. Otherwise, if you die and have to use the stock weapon, be prepared to spend some long minutes fighting bosses. As far as unlicensed 16-bit shooters go, this one carries a strong resemblance with Magic Girl in the way enemies appear on screen. In fact, if you exchanged the main ship's sprites it would be hard to notice which game is which from a screenshot. Slowdown feast aside, at least Earth Defense doesn't suffer from the awful frame rate Magic Girl is famous for. Another annoying feature is the way controls are implemented. It is common knowledge that the crushing majority of shooters use the B button for bombing, but here you have to press the C button. Human conditioning is really amazing: I lost count of how many times I died when trying to panic by pushing B! This game has a misleading nice intro and tricks you into believing it could actually deliver more than it does by allowing 2-player co-op action (I don't even want to imagine how bad slowdown would get in this mode...). There are also no useful remarks to be made about the music, except for the rather cool 5th stage BGM. At least it makes for a mild challenge if you want to beat it with just one credit. 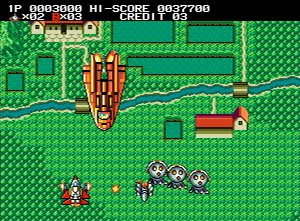 I've always heard horrible things about other AV Artisan/Realtec unlicensed Mega Drive releases such as Funny World & Balloon Boy, and that's why I feel relieved to know that Earth Defense is the only shmup they ever did for the console. What and odd Japan-exclusive title... Short in length, and yet frustratingly hard at first play. The SNES is not famous for having an extraordinary shmup library, and Acrobat Mission helps to keep that statement alive by being weird, clunky and almost completely devoid of any replay value. It would be interesting to see the Arcade original someday, just to check how badly ported it was for Nintendo's 16-bit console. First and foremost, there's no option to turn autofire ON. We all know there's only one game that kinda does it right, and that game is R-Type. Since this SNES oddball is nothing like Irem's classic, you're stuck with a lot of button mashing in between charge attacking and bombing. Charge attack can be done with either one of the two available extra weapons: the W (wide) and the H (hurricane). It can't be used with the stock weapon. Keeping the fire button pressed will cause the ship to glow and charge, and the button's release will trigger a special attack. Don't ever bother doing this with the H weapon - it's glitchy and ultimately useless. I think it's better to stick to W 100% of the time. Its special attack even has the ability to annihilate most of the enemy fire. Not only is the H weapon glitchy, but the bomb takes a long time to explode after you've used it. It's not uncommon to die while waiting to be warmly protected by the bomb blast, which forces you to time your bombing accurately, especially against bosses. Enemy fire can be overwhelming at times, and a good deal of movement is required in order to survive. And the huge hitbox? Damn, if you think you've seen your load of big hitboxes in your shmupping career, I'm pretty sure you'll have a different opinion after facing Acrobat Mission's last boss. The rest of the gameplay aspects are probably there to help. You can't die by colliding with enemies or debris. In fact, you can knock them at any time or even get pressed against the bottom of the screen - be aware though that the ricochets can send you straight into a lost bullet or laser! The ship's booster also causes some damage, but it's so sluggish and slowly animated that you can't really rely on it. When you get hit, you'll wander about smoking for some seconds, with the chance to damage some enemies when you finally explode (I particularly find this annoying). On a side note, continues are unlimited and provide for less stress when practicing for the 1CC. As I mentioned earlier, replay value is practically non-existent. It couldn't be different, for this is a very boring shooter. Since I always try to find at least one thing redeeming about games - apart from challenge - for this one I have to go with the 1st stage BGM. I noticed I started to like it during my last runs, because it's rather cool and has a somewhat epic feel. Unfortunately, that doesn't happen with the other songs in the game. I do have one useful (well, I think it is...) hint for whoever aims to 1CC Acrobat Mission. It seems that the strongest part of the W weapon charge attack is its tip. Keep that in mind while fighting that pricky last boss. 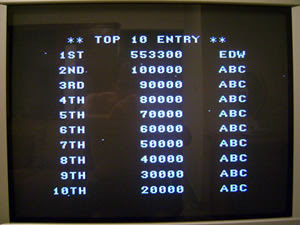 Oh, and try to get there with extra lives in stock (gained with every 100.000 points). It had been a long time since I broke a video game controller. Actually, I think I never broke one, they just got to the point of having a bad D-pad or buttons with bad contact, what forced me to get new ones. But I did break one a few days ago, and it was on the PS2, at the very moment when I reached for the first time the last stage of a game I was trying to 1CC. Talk about bad timing, huh? Now how come this guy destroys the left analog stick while playing a shmup???? That, dear readers, is a collateral effect of Triangle Service's humble XII Stag, a vertical shooter that forces you to use the so-called Side Attack in order to reach for higher scores. It consists of moving your ship fast from one side to the other (lefts and rights), which produces a whipping effect and damages enemies (two fast dashes generate a stronger Side Attack). That's where the scoring system kicks in: when an enemy is destroyed by a Side Attack, a ×2 multiplier will come in effect and soon vanish. However, if you keep killing enemies fast enough with the Side Attack, the multiplier will go up until the maximum of ×12, paving the way for much better scores. 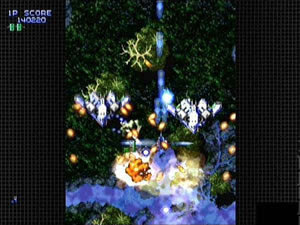 For those not willing to risk the integrity of their analog sticks, there's also the option to turn on the Rapid Side Attack (RSA), with the effect of mapping the Side Attack to a button and releasing the player from the consequences of side attacking manually, thus making the whole game a lot easier to play. Purists like myself, however, will go for full defaults, and that means RSA off - and the possibility of damaging the controller in the long run, as I did. In order to keep on playing, I opened it and inverted the analog sticks, practically getting myself a new controller since the right analog stick is useless for shmups! Graphically, XII Stag is competent - everything is very smoothly animated. The music is standard fare - not outstanding, not bad but not memorable at all. 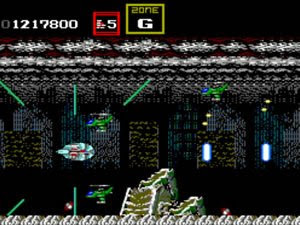 Stage design is very bland in the beginning (stages 1 and 2 look almost exactly the same), but then the game decides to change: a ground stage follows, then a giant flying aircraft, marshes, another ground base, a meteor-filled burst into outer space and a final confrontation with the last boss. The scrolling alternates a lot between slow and fast, in a variation that's quite welcome and helps to shift XII Stag from the level of mediocre. You can power up only four times with the blue orbs, and further orbs are worth 1.000 points each. Regarding the scoring system, the game also encourages you to bomb because every bullet caught within the bomb's radius will melt and deliver 1.000 points. You also remain invincible if you stay inside this radius, so it's mandatory to know when and where to bomb if one wants to go for higher scores. 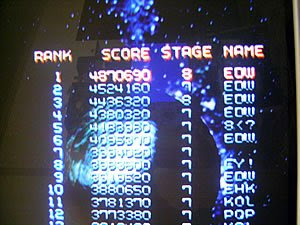 A somewhat useless feature are the checkpoints for in-stage scores, which are displayed graphically at the end of every stage and tell you how well you did against the current partial high scores. There's no granting of extra lives, so the whole game must be completed with just 3 ships. 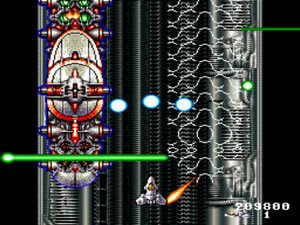 stage 3: in the last form of the boss he doesn't shoot - stand close to him on the top and Side Attack all incoming small ships until you have a ×12 multiplier - then you can choose to kill him or keep doing that for a while, knowing that the boss will leave the screen eventually. 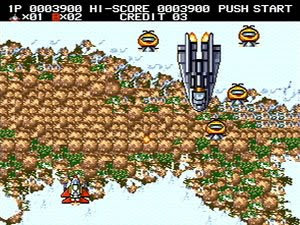 stage 5: kill all enemies from the second staggering wave of small planes and you'll get a different intermediate section. 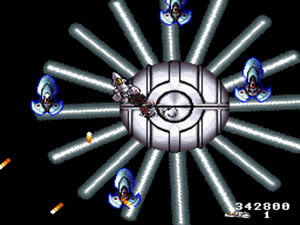 Answering to a "shmups torture" call from a fellow shmupper in the shmup forums, the game I selected for my torture session was XDR - X-Dazedly-Ray, which is known worldwide as one of the smelliest turds ever to grace the almighty Mega Drive. Using it as pre-sleep relaxation fun, on the first day I got familiarized with the game, reaching the 6th boss. On the second day I looped it. And on the third day I had my definitive run for high score purposes. For such a bad game, the time I spent with it wasn't so short, but then again the game is relatively easy. Initial impressions of XDR reminded me a lot of Insector X for the same platform, since both games seem to share a good number of sound effects. I have absolutely no idea of developer Unipacc's origin, but one could think it was some sort of a rogue and utterly failed stray division of Taito. Thankfully XDR was their only outing as far as I know of. As bland as the gameplay is, it surely doesn't hurt as much as the slow pacing and regular music. The ship's hitbox is huge, and it takes some time to get used to not crashing on obstacles by accident. 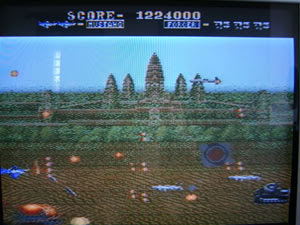 You have 4 different speeds available, and your 3 weapons are the main beam (B icon), laser (L icon) and wave shot (W icon), with 2 maximum options (O icon), shield (S icon) and missiles (M icon) on the side [and also extra lives with the "1" icon - EDIT 6-MAY-2010]. From there you know that it borrows a lot from the Darius series, including the fact that the game urges you to turn your ship into a powerhouse and not die – or else you're screwed. To make things a tad more difficult there's also the checkpoint system, which splits the stages in two sections. 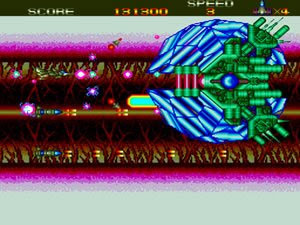 The other franchise that comes to mind while you're playing XDR is Gradius, whose trademark is all over the bosses. Weirdly enough, you don't get any scoring when you kill them. There's also no bonus score if you get extra icons after the maximum power has been reached. Further loops of the game have stronger enemies, but there seems to be no change in bullet speed/count. I can't finish this text without mentioning the incredible "warp from hell": due to the extraordinary game's programming, when you're fighting the last boss your ship might disappear for no reason and leave you blind for some seconds. A secret boss power or another glaring flaw of an already poor game? You tell me! Note: this text was cross-posted with minor changes on Sega-16. The almighty NES had Gradius. And that's a huge thing to say for any gamer who grew up during the 80s and 90s, for Sega home machines never saw a glimpse of Konami's most famous shooter at the time. 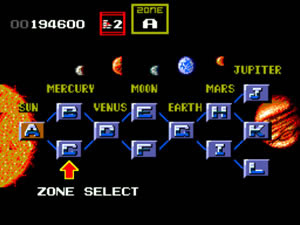 The Master System, however, had some honors to compensate for that, and the most notable one was its famous port for the also classic R-Type. Of course classic shmup titles are not restricted to these series only, and even though Darius is lesser known or appreciated than the aforementioned ones, it still holds a special place in my heart as one of the best to ever grace the shmup scenario. Especially Darius II, which in the west was renamed as Sagaia. The name "Sagaia" actually always sounded very nice to my ears, in a case where this kind of change didn't exactly mean a bad thing at all. Sagaia was ported rather late for the Master System, in 1992. By then the Mega Drive was steaming in full throttle, but Sega's 8-bit console was pretty much alive in a couple of dedicated places like Brazil. 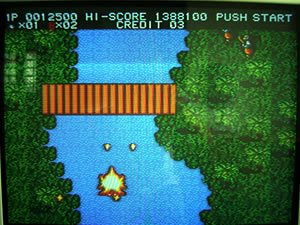 And having played the MD version in every single detail, it was no wonder I would eventually have to try the SMS game. For those who have no clue of what Darius means: here you fight fish and sea creatures in deep outer space or in Earth-like environments. The order of the stages can be chosen in a tree fashion named according to the alphabet, and power-ups help you improve your main shot, laser, bombs and shield. Oh, the shield in Darius, the best shield sprites ever designed for a shoot'em up! I assume the main concern for everybody is how much was taken out of the original game in order to fit the Master System limitations. The good news is that from a gameplay point of view everything is there, apart from the reduced number of stages. You can even choose between Proco Jr. and Tiat Young (who has a ship already powered-up once as default). The bad news is that you get lots of flicker during mid-boss and boss fights and a great deal of slowdown when things get hectic. While graphically the game looks really good from screenshots, seeing it in motion is sort of a mixed bag of 8-bit accomplishment. There's nothing noteworthy in the first stages, but as the game progresses you're granted with very fine parallax, as in stages E and H. Stage J, on the other hand, is a living nightmare because of the choppy scrolling and all the previously mentioned problems happening at the same time. The music is where the SMS port tries to redeem itself. Sagaia has some of the best composed tracks ever, courtesy of Zuntata, and that's no different in this game. You will get in the mood for some space fish blasting, trust me! 8 bit shmups are dead for most shmuppers out there, and the fact that this version is not that good doesn't help in justifying people to play or even buy it. Nevertheless, Darius fans should definitely try the game if they get the chance. It's certainly harder than the Mega Drive port - except for the bosses, who die easily if you're powered up - and will probably entertain you for a lazy afternoon. Still in the mood for some World War II action, I got myself thinking about a horizontal shooter that would allow me to have some fun after the nice albeit difficult 1CCing of Strikers 1945 II. It should be easy, and it didn't matter if I had beaten it before. 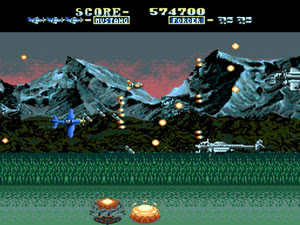 That's when my eyes browsed through my collection and stopped on Fire Mustang for the Mega Drive. And yes, this is an easy game, at least in its first loop. It's perfect for those relaxation moments, for its simplicity alone. 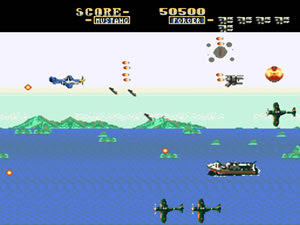 Its original name in the arcades was US AAF Mustang, and I remember that I had the honor to see this machine running in a local joint when I was a kid - and being amazed by the fast parallax scrolling and the nice bombing effects that sometimes shook the whole screen. The nicest thing I can say about the Mega Drive port is that it seems to preserve the scrolling speed of the arcade with no signs of slowdown. A little flicker happens now and then during boss confrontations, but it's no big deal. Graphics are not spectacular when judged by a screenshot, but they do look nice with all the parallax, and the explosion sprites are really cool for a 16-bit game. 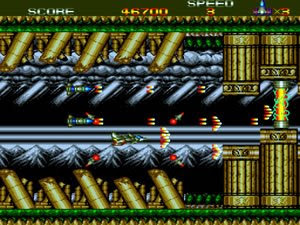 It has a fast pace and allows for all kinds of manoeuvers, since there are no obstacles whatsoever apart from enemies. This is kinda odd for a hori shmup, but in my opinion it adds to the aforementioned relaxation nature of the title. There's just one type of weapon, which can be powered up twice for a final 3-way forward vulcan shot, additionaly complemented by small bombs dropped forward in a Darius fashion - these have devastating power when used at close range. Smart bombs (here called Forcers) can be stocked up to a number of 8, and will destroy every bullet on screen while inflicting damage to enemies, no matter if they're in the bombing range or not. Each power-up or bomb icon collected after you've reached the maximum number allowed is worth 10.000 points, and that's all for scoring possibilities. There's also a ranking system that will make enemy firepower more intense if you reach later levels with extra lives gained, and that's the little challenge that rises as the game comes close to its end. I don't have any problem with that, and by that I mean the simplicity of the weapon and scoring system. I can live with it. The real problem of this game is how badly programmed it is. You have 2 continues when you start, and it's just impossible to reject a continue after you die your last life. This makes Fire Mustang for the Mega Drive the first shmup I know that has an auto-continue feature! And guess what? When you continue you lose track of your current score, because there's no high score screen and the computer demo play only shows your last score. 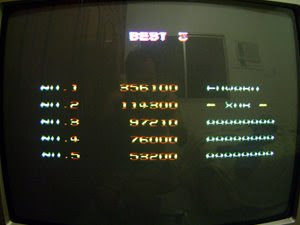 That way, if you want to take note of your high score you have to start the game, die 3 times, continue, die 3 times again, continue and only then have your 1 credit run (because then you have the game over screen and your score is buffered to the demo play). For a title that's relatively short Fire Mustang is mildly fun, and at least compensates the lack of substance with a very fluid gameplay. The best tune is the 6th stage BGM, while all others are just military resembling 16-bit music fare. Being a cheap Japan only title (if you don't count its inclusion in the game list of the late Mega Drive consoles released in Brazil by TecToy), I believe it's worth getting for all western MD and shmup collectors alike. Here's my high score on this run. Got up to loop 2-4.